Thanks for checking out the raywenderlich.com AR/VR Week sale FAQ! We’ve created this page to answer some of the most common questions about this sale. What’s included in the Unity AR & VR Starter Bundle? The Unity AR & VR Starter Bundle is a two-book bundle. 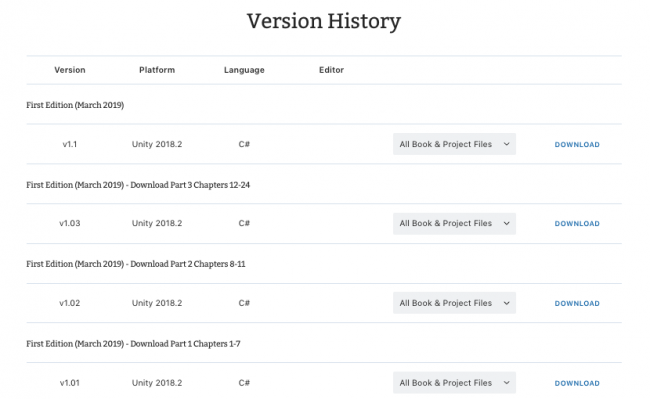 It includes two digital editions (in both PDF and ePub format) of Unity AR & VR by Tutorials, and Unity Games by Tutorials, along with complete source code for all projects in the books. What’s included in the iOS AR Starter Bundle? The iOS AR Starter Bundle is a two-book bundle. It includes two digital editions (in both PDF and ePub format) of ARKit by Tutorials, and iOS Apprentice, along with complete source code for all projects in the books. This sale will run from Monday, March 25 2019, until the end of Friday, March 29 2019. How much of a discount do the two bundles give me? The usual retail value of our books is $59.99, so at $59.99 for either bundle, you’re getting each book in the bundle for half price! If you don’t want the bundle, you can still get Unity AR & VR by Tutorials, or ARKit by Tutorials, for just $44.99 — that’s a savings of 25% off the cover price when you buy individual books. Whichever way you look at it, it’s an amazing deal! For all book purchases on our site, we offer a 30-day refund period, and we do allow partial refunds if you wish to return some books from a bundle. Simply contact us at [email protected] for assistance. Why am I being charged more than $59.99 when I purchase the bundle? You’re likely being charged tax on your purchase, which is based on the country from which you are making the purchase. Why am I being charged tax, since I am tax-exempt? If you or your company is tax-exempt, there should be a spot to fill in your VAT number during the purchase process. Here are some detailed instructions. If you feel you have been charged tax in error, email our support team at [email protected] and we’ll look into it for you. Can I get an invoice or receipt for my purchase? Absolutely. Log in to your account and visit https://store.raywenderlich.com/receipts, where you can download all invoices for your purchases with us. Do your books come with free updates? While we can’t guarantee that each one of our books will be updated every year, we usually update most of them. For those books that we do update, anyone who has purchased the digital edition of our books will receive an updated edition for free. I already have one of these books. Can I “upgrade” to the bundle? If you’ve purchased any of the books in either bundle within the last 30 days and really want to take advantage of the bundle deal, get in touch with our support team at [email protected] and they’ll take care of you. I missed the deal! Can I get it after the sale ends? Oops! Sorry you missed it, but this is a special deal only and won’t be available after Friday, March 29, 2019. Be sure to sign up to raywenderlich.com weekly to get notified of any sales in the future. How do I download the files for Unity AR & VR by Tutorials? There’s so much great content in Unity AR & VR by Tutorials that we had to split the downloads into multiple parts! There is one package each for Chapters 1-7, Chapters 8-11, and Chapters 12-24. I don’t see my question answered here. Email [email protected] and our customer support team will do their best to help you out! Next articleAnnouncing AR/VR Week at raywenderlich.com!